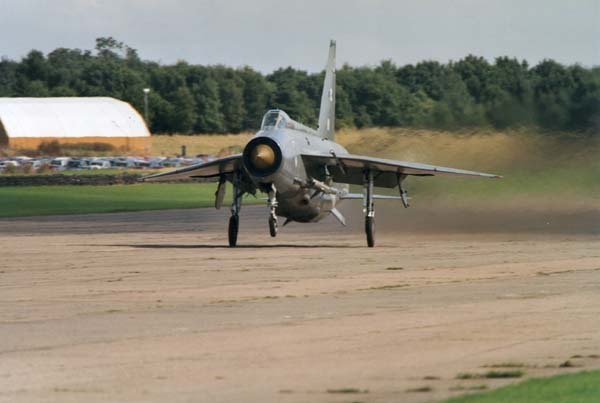 We are a group of enthusiasts based at Bruntingthopre airfield near Leicester who are dedicated to maintaining two of the last few remaining English Electric Lightning aircraft. The unearthly siren wail catapults the crew from their rest, as the telebrief springs to life: “Binbrook this is Boulmer-alert two Lightnings, Mission 51 and 52-vector 040, climb Flight Level 250, contact Boulmer fighter frequency as pre-briefed. Scramble-scramble-scramble!” The shriek of Avpin starters presages a monstrous roar as two massive drab shapes surge from the Quick Reaction Alert hangar and power down the glistening runway, spray boiling in their wake. Lightning reheats spear the gloom and the ground shakes with their thunder. It is 1988 and a RAF tractor tows a gaunt, spares-recovered Lightning airframe through the mist of a Binbrook morning and manoeuvres it on to the end of a lengthening line of derelict ‘decoys’ by Crash Gate 2. A depressing scene for the many enthusiasts who over the years had made pilgrimage to the English Electric Lightning’s final haunts atop the Lincolnshire wolds, and who were now observing the gloomy final months of the Lightning’s service career. Fortunately, a small band was already planning to save at least one of the beasts from extinction. The Ministry of Defence (MOD) tender form required a name, and so the ‘Lightning Preservation Group’ was formed. Shortly afterwards, in an atmosphere of euphoria and some disbelief, the group received the news that their tender had been successful. 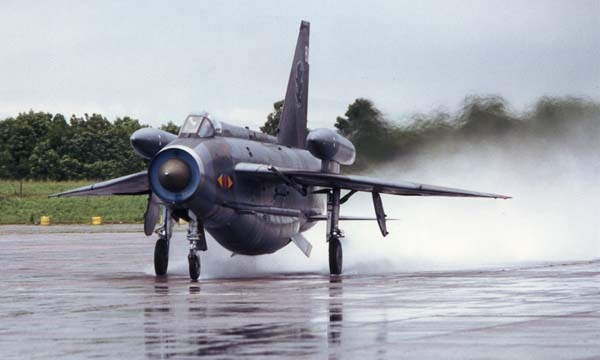 They now owned their very own jet fighter, and not just any old jet fighter, but an example of Warton’s finest-Britain’s only home-grown Mach 2 interceptor! 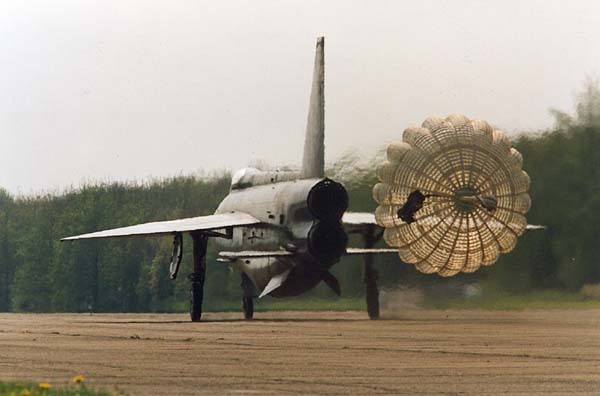 The Lightning was offered a retirement home by the Walton family, owners of Bruntingthorpe airfield in Leicestershire, and on June 24, 1988, Flt Lt Chris Berners-Price made several low passes across the tower and along the runway (‘just burning off fuel’) before touching down, having delivered XR728 ‘JS’, favoured mount of RAF Binbrook’s Station Commander, Group Captain John Spencer, for preservation. The initial plan was to keep the aircraft as a static exhibit-indeed the RAF’s intention was to drill holes intothe fuel tanks just to make sure, but fortunately their employees were dissuaded from this sacrilege. Much to his surprise, Ray Nightingale, a former member of the Binbrook ground crew, had become involved with the LPG: “If you’d told me six months ago I’d be giving up my weekends to work on Lightnings I’d have said you were mad!” Ray held the firm opinion that running the engines was the best way to preserve the aircraft as it would drive out moisture and help keep systems and seals serviceable, and so it proved. 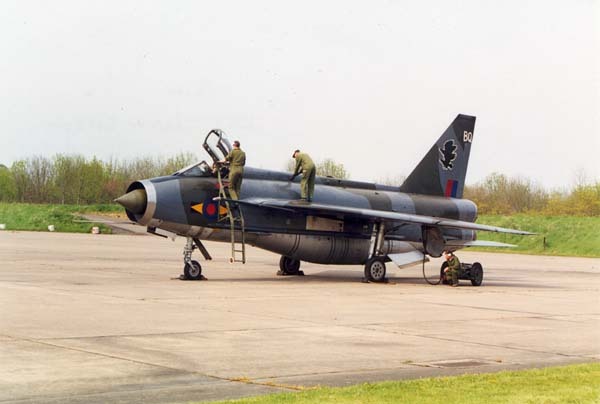 Whilst the real excitement at Bruntingthorpe is obviously the reheat runs themselves, visitors can also nostalgically witness at close quarters the prepping and starting of a lightning. Lightnings XR728 and XS904 are both maintained in taxiable condition and can be viewed in close-up on the biannual open days, normally held in May and August and advertised in FlyPast (foot and mouth disease unfortunately ‘torpedoed’ that planned for May 2001). The LPG open days are usually held in conjunction with British Aviation Heritage, whose collection of nostalgia-inducing hardware, such as Victor XM715 and Buccaneer XX900, also give runway demonstrations. Cockpit tours of the Lightnings, and of Nev Martin’s variety of aircraft nose sections, help visitors to get a feel (and a smell!) of the aircraft. Thirteen years on, former Lightning pilots continue to impress the crowds with the noise and fury of reheat runs, reaching speeds approaching 150mph-the temptation to tweak back on the stick must be intense, but as commented on many times, the UK Civil Aviation Authority has not approved civilian operation of Lightnings. Quick Reaction AlertThe Group’s third major acquisition occurred in 1994 when the Quick Reaction Alert (QRA) hangar from the former Lightning/Phantom base of RAF Wattisham was obtained in ‘kit form’. In the 1960’s, QRA hangars (or Q-Sheds) were built adjacent to the main runways at RAF stations Wattisham, Binbrook and Leuchars to enhance the Lightning’s rapid response capability-and reduce fuel use during taxiing! 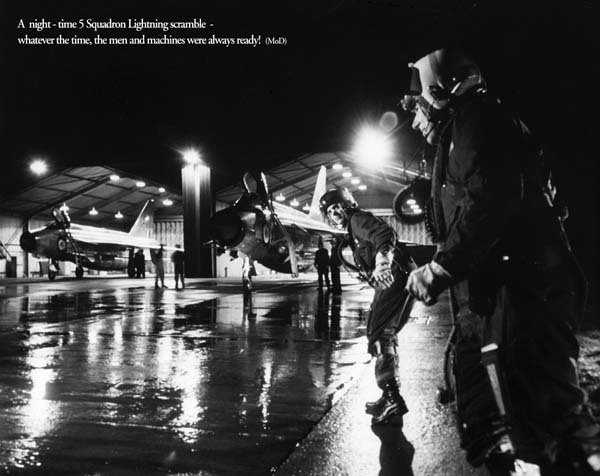 Lightnings were held on 10 minutes readiness against any intrusion into the UK Air Defence Region, and were in the vanguard of the defence of the United Kingdom from 1960 to 1988. The Wattisham Q-Shed was obtained by the LPG when the RAF relinquished the base, following the retirement of the Phantom force. Trafalgar House Construction generously donated the Q-Shed to the LPG in January 1994 and it was carefully dismantled and moved on six forty-foot trailers to Bruntingthorpe, where it is stored awaiting reincarnation. In addition to offering the two Lightnings welcome protection from the elements, the Q-Shed is a historic building in its own right, an important artefact of the cold war era and its reconstruction will advance further the ‘working’ aviation museum which has developed under the wing of BAH. The high cost of Q-Shed construction, approximately £120,000 is partly due to the large volume of concrete required, as the floor area is large and the dispersal where the hangar will stand must be built up, as it lies about 18 inches (45cm) below the level of the taxiway. Stage 1 of the fund-raisingappeal was launched under the slogan ‘They Protected You, Now You Can Protect Them’, and a very successful ‘QRA Day’ at Bruntingthorpe in July last year helped raise over £9,000 in donations within a few weeks. 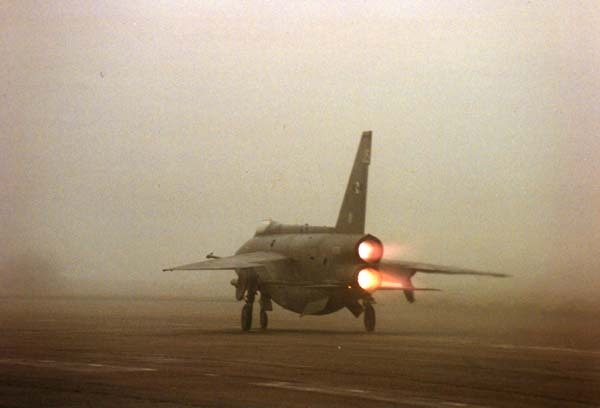 Both Lightnings were fast-taxied on reheat, with former Lightning jockeys Dennis Brooks and Tony Paxton at the controls, and in between the two runs members of the LPG carried out a sponsored ‘Lightning Pull’ for a mile along the runway-which was the cue for the heavens to open. The last quarter-mile was uphill and quite a struggle, but fortunately the coronary care unit was not required! This year’s QRA Day was on Sunday July 15th, and it is hoped that the funds raised at this successful event will be sufficient to kick-start the first phase of the project, to shot-blast, paint and erect the framework of the hangar. The rate of progress will then depend on the generosity of supporters. Donations of any size are welcomed, and if you give £50 or more then your name (or a name of your choice) will be permanently displayed on a Roll of Honour inside the hangar. Do it now!! From the July 2001 issue of FlyPast Magazine, reproduced with permission. © KEY Publishing, all rights reserved, 2001 Please make any donations payable to ‘LPG’, c/o Richard Norris, 2 Spring Hill, Little Staughton, Beds., MK44 2BS (Tel: 01234 378827). 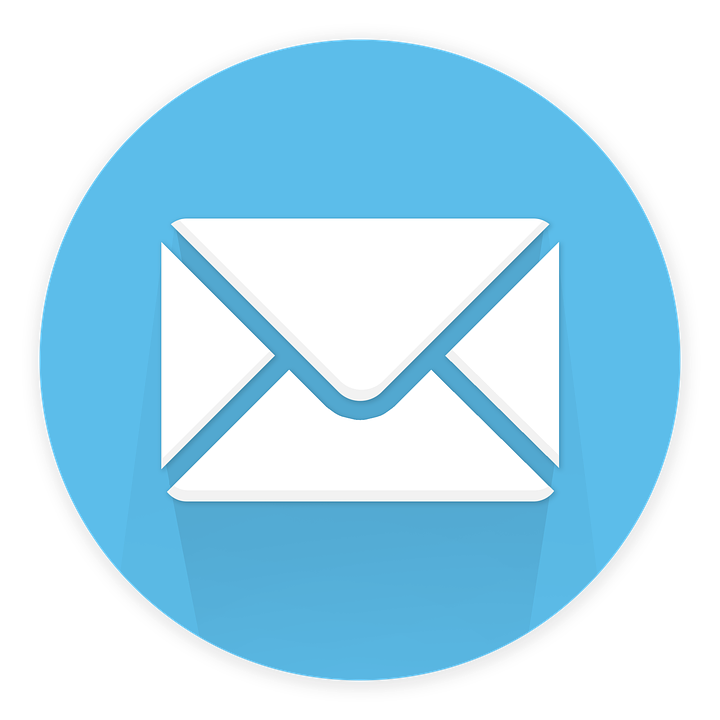 E-mail: Scott McPhee (Secretary) Unfortunately, the LPG does not currently have the manpower to run a membership scheme, but they are happy to talk Lightnings if you wish to make contact!